When I was deciding if I should take on the HIFU Face & Body lift, I wanted proof that the treatment REALLY worked. After all, only one treatment per year for such great results sounds crazy, right? (HIFU stands for High Intensity Focused Ultrasound). And WOW! the good folks over at 3D Lipo (the inventors of the HIFU) really did rise to the challenge. 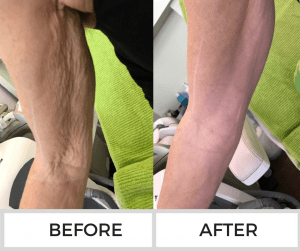 They demonstrated to me how the treatment works–not only on the face, but on the rather challenging loose skin on the arms you see in this before-after image. 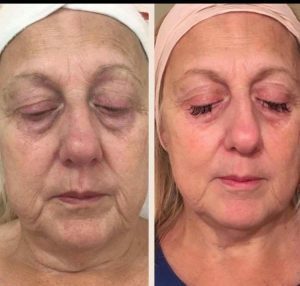 The whole process takes about 3 hours for a full face and neck, and the transformation is instant…but the lifting result actually gets better over the next 100 days. Some of my lovely clients have already benefited from our Introductory Launch Offer, and they are LOVING their results. 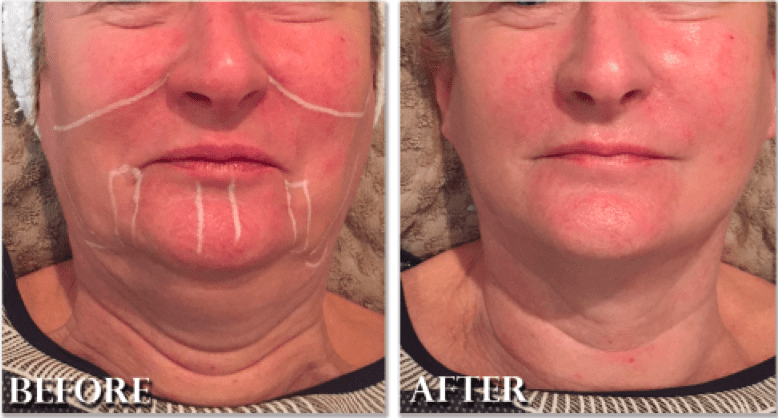 You can opt for this super-lifting treatment on your full face (this includes jowls and neck), or half face, depending on your areas of concern. As part of this launch offer, we are also giving you £105 FREE worth of SKINADE – the amazing Collagen drink. And to make this even more affordable for you, we have introduced a Payment Plan! Ask us about the payment plan when you call us on 01708 453355. The bad news is, the 30% Special Launch Offer is only available until Wednesday September 13th, then we have to go back to charging full price. You can have the treatment ANY time, but to lock in your massive 30% Launch Offer you must have paid for it by close of business on Wednesday the 13th September. Pick up the ‘phone and call us on 01708 453355, or pop into the salon today to make sure you get this never-to-be-repeated pricing for your HIFU face/body lift – we have limited appointment slots left and we are expecting these to sell out quickly!